Eleven Boy Scouts from Menlo Park Troop 222 recently earned the prestigious rank of Eagle Scout, taking part in National Eagle Courts of Honor – five on November 19, 2016, and six on January 7, 2017. To attain the Eagle rank, a Boy Scout must earn a minimum of 21 merit badges, serve in a leadership position within the troop for at least six months, plan, develop and give leadership to others in a service project benefitting a school, a religious institution or the community and demonstrate Scout spirit by living the Scout Oath and Scout Law. Paul Bargar, a senior at Menlo-Atherton High School, has been involved in many service projects including Scouting for Food and the placement of flags at Golden Gateway National Cemetery in remembrance of veterans on Memorial Day. His Eagle project involved the construction of a 35-foot retaining wall along Canada Road. Ryan Bever, a senior at Menlo-Atherton High School, started scouting at the end of kindergarten. He’s held several positions in Troop 222, including troop guide and patrol leader. He’s participated in four 50- mile backpacking trips – the latest including the summit of Mt Whitney. His Eagle project was the creation of five emergency response trailers for the City of Menlo Park, in cooperation with the Menlo Park Fire Department. Patrick Driscoll recently graduated from Junipero Serra High School and is now a freshman at Creighton University in Omaha, Nebraska, where he will be majoring in Environmental Science and Biology. For his Eagle project, Patrick led a team in building a platform for special needs children to interact with horses at BOK Ranch, a therapeutic horse ranch in Woodside. 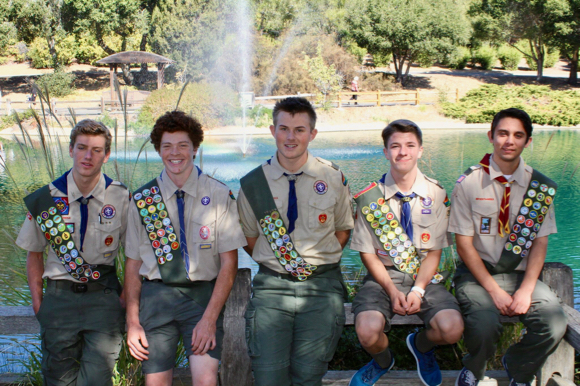 Patrick Johnson, a senior at Menlo-Atherton High School has particularly enjoyed attending Boy Scout summer camps and several of the High Adventure camps. His Eagle project took place at Edgewood County Park where Patrick and his crew of volunteers removed two dumpsters of broken concrete (over 5 tons) then built a 70-foot planter box that will be used to plant and nurture seedlings of native plants. Jack Hansen, a sophomore at Menlo-Atherton High School, selected a leadership service project refurbishing and repainting a ramp at BOK ranch. Leadership roles include Assistant Patrol Leader, Patrol Leader and Quartermaster. Jack has completed five Fifty Milers during his tenure as a Scout and looks forward to helping new Scouts learn to be outdoorsmen. Trevor Kelly, a senior at Summit Preparatory High School, chose an Eagle leadership service project that involved building a 16’ X 12’ Pergola at Summit Prep for students and faculty to enjoy. The structure was dedicated to a fellow classmate at Summit who passed away over winter break 2015. Ian Lange-McPherson, a senior at Menlo-Atherton High School, has traversed many parts of the Sierras with Troop 222 including summiting Mt. Whitney and Half Dome. He has also earned the Triple Crown of Adventure by attending the Philmont, Sea Base and Northern Tier High Adventure camps. For his Eagle project, Ian designed and organized five emergency trailers for the Menlo Park Fire Protection District. Henry Marks, a senior at Menlo-Atherton High School, chose a leadership service project involving the revitalization and renovation of the plant identification trail at the Menlo Civic Center. Henry has completed five Fifty Milers, including three with his father during his tenure as a Scout. Nicholas Nolasco is a senior at Menlo-Atherton High School, His Eagle leadership service project was completed at the Menlo Park Senior Center in East Menlo Park, with a project that included building two benches, a planter box, a canopy and refurbishing the path leading to them. Marshall Williams is a sophomore who is homeschooled. His Scouting journey has spanned three states and four Scouting units including New York, Florida and California. Marshall’s Eagle leadership service project involved co-leading, creating, and filling five trailers with emergency supplies for the Menlo Park Community Emergency Response Team that can be used should an emergency strike the community. Troop 222 has been chartered by the Boy Scouts of America for over 60 years in Menlo Park and is currently headed by Scoutmaster Jay Hansen. Photo top: Top row [l to r]: Patrick Driscoll, Patrick Johnson, Kyle Peterson; Bottom row [l to r]: Paul Bargar, Ian Lange-McPherson, Ryan Bever; Photo by Kristin Fichou. Terrific bunch of young men. Congrats to all! Congratulations to our new Eagle Scouts ! Well done Gentlemen !